A New Way to Train : Running on Empty? For as long as we can remember, our coaches and trainers have drilled into our heads the importance of starting the day off right—with a good breakfast. Now come along a growing number of elite runners whose fasting runs and subsequent improved performance might make you think twice about reaching for breakfast before you hit the road. 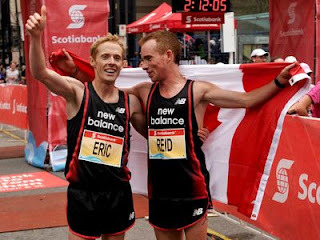 Last fall Eric Gillis (2:11:27) and Reid Coolsaet (2:10:55) (pictured right) broke with traditional training approaches, opting to forgo some pre training meals. This approach resulted in personal bests, and spots on the Canadian Olympic team for the Olympic Marathon in London. Even if you are a weekend warrior and not an Olympic hopeful, fasted running can take your game, and your body to the next level some argue. Researchers have discovered that training in a state of carbohydrate deprivation helps muscle to burn more fat. It also increases your body’s capacity to store carbohydrate. Therefore, you will be leaner and able to train longer. Let’s get started on how to implement fasted training into your workouts. First, empty the tank. The easiest way is to train in the morning before breakfast. For those who want more of a challenge, you can do an intense workout in the morning. Follow this with an afternoon run without refilling carbohydrate stores. Secondly, aim to run for at least an hour. This may take up to a month to build up to this level. Still, anything less should be considered a stepping stone. Physiologist Trent Stellingwerff, Ph.D. of the Canadian Sports Centre-Pacific says that it takes about an hour of fasted running to initiate fat burning. Thirdly, refuel immediately following a fasted run. Alex Hutchinson of Runner’s World says, “Aim for 15 to 25 grams of protein and 60 to 100 grams of carbohydrate, depending on your size and the intensity of your run.” Hutchinson also cautions to carefully monitor recovery of fasted runs before increasing the intensity. However, everyone is not an adherent of fasted running. 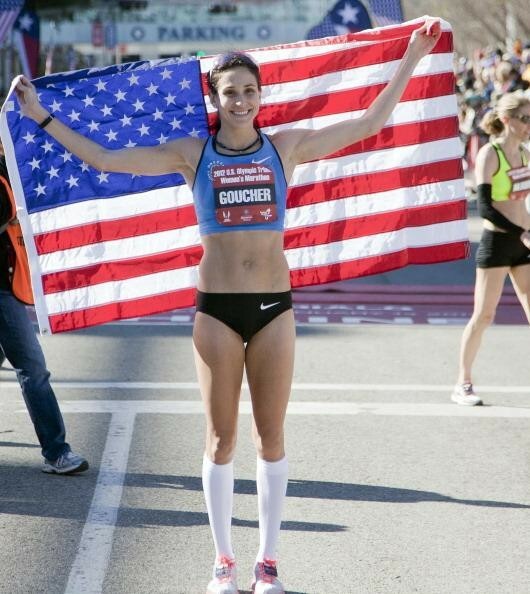 Elite U.S. marathoner Kara Goucher (pictured on the right) (2:26:06) has yet to try it. "I feel like I have to be properly fueled to run," says Goucher. With depleted glycogen stores, you can’t run as fast or for as long. Therefore, if you constantly use fasted running, it is impossible to build the speed and endurance necessary to compete at an elite level or to set new personal bests. However, if you use fasted running sparingly, it can be a great way to mix up your training and try something new. Try this strategy out and let us know what you think. For further questions or comments, you can write in the boxes below or email me at bob@bobwellsfitness.com.